Coming soon after the recent GST Council meet, the GST Bills moved further yesterday on their course to becoming a reality. The Finance Minister, Shri. Arun Jaitley tabled four legislations i.e. Central GST (CGST), Union Territory GST (UTGST), Integrated GST (IGST) and Compensation in the Lok Sabha on March 27, 2017 and these will be taken up for discussion tomorrow i.e, March 29th 2017. These bills were introduced as Money Bills to ensure that they do not face any hurdles in the Rajya Sabha. After the passage of the Constitutional Amendment Act in August 2016, the Government released the revised draft CGST, SGST Act and IGST Acts (referred to as Model Draft GST Law) in the public domain November 26, 2016. In the Model Draft GST Law, all 'supply' such as sale, transfer, barter, lease, import of services etc. of goods and/ or services made for a consideration will attract CGST (to be levied by the Centre) and SGST (to be levied by the State). Moreover, certain supplies specified in Schedule I of the CGST law state that even supplies made without consideration, such as permanent transfer of business assets on which credit is availed, transaction with related entities, transactions with agents etc. will attract GST. a. In Schedule I of the CGST law, it is provided that gifts not exceeding INR 50,000/- in value in a financial year by an employer to an employee shall not be treated as supply of goods or services or both. This provision could open a Pandora?s Box as free canteen facilities, travel arrangements for employees exceeding INR 50,000 limit may attract GST as they do not qualify as gifts. b. Schedule IV (listing exemption to certain services provided by Government such as issuance of passport, driving license etc. ), which was available in the Model Draft GST Law, has now been omitted. Typically, the GST liability is to be discharged by the supplier of goods/ service or both. However, in specific cases, the liability to pay tax is cast on the recipient of the supply instead of the supplier. This is known as Reverse Charge Mechanism (RCM). The Model Draft GST Law provides for RCM on notified categories of supply of goods or services or both. Note: The GST bills introduced yesterday provide that in cases of supply by an unregistered supplier to a registered person, GST shall be paid by the recipient under RCM. The Model Draft GST Law suggests that the liability to pay CGST / SGST will arise at the time of supply of goods and services which is to be considered as per few separate provisions. These provisions contemplate the payment of GST on either the earliest date of issuance of invoice for the supply or prescribed last day by which invoice is required to be issued or the date of receipt of payment. Given that there could be more than one way to determine time of supply, reconciliation between revenue as per financials and as per GST could be a major challenge for businesses. Note: The GST bills provide that the ?time of supply?, to the extent it relates to an addition in the value of supply, by way of interest, late fee or penalty for delayed payment, of any consideration, shall be on the date on which the supplier receives such additional value. The Model Draft GST Law provides that an intra-state supply of goods and/or services will attract CGST and SGST/ UTGST (UTGST in Andaman and Nicobar Islands, Lakshadweep, Dadra and Nagar Haveli, Daman and Diu, Chandigarh and other territories) whereas an inter-state supply will attract IGST. Thus, it becomes crucial to determine whether a transaction is 'intra-state' or 'inter-state'. The Model Draft GST Law casts the onus of determining whether a transaction is an 'intra-State' or 'inter-State' on the assessee. If a taxpayer wrongly determines an intra-state transaction as inter-state and in-turn pays IGST, then the taxpayer will be refunded IGST but will have to pay applicable GST. However, there could be multiple scenarios such as supply of services in relation to immovable property, services to and by SEZ etc. where this generic principle will not be applicable and specific provisions will determine the place of supply. The business will therefore have to scroll through all the ?place of supply? provisions before determining the place of supply. And in case of error filing, bear the cost unnecessarily. Note: Now, the GST Bills specifically provide that interest will not be payable on delayed payment of say CGST and SGST if taxpayer has wrongly paid IGST. GST will be payable on the ?transaction value? which is the price actually paid or payable for the said supply of goods and/or services between unrelated parties. The transaction value is also said to include all sale related expenses such as packing, commissions etc. Even subsidies linked to supply; barring government subsidies will be included. However, discounts/ incentives given before or at the time of supply will be permissible as a deduction from the transaction value. As far as discounts given after supply go, they will be permissible as deduction subject to the fulfilment of prescribed conditions. Note: The GST Bills contain an empowering provision for GST Valuation Rules which could be prescribed later. The current CENVAT (Central Value Added Tax) credit regime disallows CENVAT credit on various services such as motor vehicle related services, catering services, employee insurance, construction of civil structure etc. Similarly, State VAT Laws restrict input tax credit with respect to construction, motor vehicle etc. This denial of credits leads to unnecessary cost burden on the assesse. It was expected that with GST seamless credit would be available to businesses without any denial or any restrictions except for say goods / services that are availed for personal use (similar to the United Kingdom VAT law). However surprisingly, input tax credit cannot be claimed on catering services, employee insurance, construction of civil structure etc. It is also proposed that credit is to be denied on goods and/or services used for personal consumption. Additionally, input tax credit shall not be available on goods lost, stolen, destroyed, written off or disposed of by way of gift or free samples. This continuation of denial will lead to substantial tax cascading. a. Credit will be available on rent-a-cab, life insurance and health insurance if the Government notifies these services as obligatory for an employer to provide to its employees under any law. Also, credit on food and beverages, outdoor catering, beauty treatment, health services, cosmetic and plastic surgery will be available. All this is available if used as inward supply for making an outward taxable supply of the same category or as an element of a taxable composite or mixed supply. b. In the Model Draft GST Law, specific provision allowed availment of credit on pipelines and telecom towers. However, this provision is omitted in the latest GST Bill. c. Now, to continue to claim the input tax credit the buyer has to ensure that he pays the supplier within 180 days from date of invoice. If payment to vendor is not made within 180 days the input tax credit will have to be reversed and availed again on payment to vendor. d. For a banking company or a financial institution including a NBFC, restriction of 50% on availment of credit shall not apply to tax paid on supplies made by one registered person to another registered person having the same PAN. There will be a total of 35 GST laws in India: one CGST law, one IGST law, one UTGST law, one Compensation law, and thirty one SGST laws for each of State, including two Union Territories with power to legislate. Note: It is pertinent to note that the model Draft CGST and IGST laws were applicable throughout India. However, as per the recent bill, CGST and IGST do not apply to Jammu and Kashmir (J&K). In the days to come, J & K taxpayers will have to watch developments closely in this regard. The rate of GST is not specified in the GST law though the maximum ceiling is prescribed to be 20% for CGST, SGST/UTGST and 40% for IGST as compared to 28% ceiling prescribed earlier in the Model Draft GST Law. As per various news reports suggest that the rates in GST regime will be 0%, 5%, 12%, 18% and 28% plus Compensation Cess. a. GST law prescribes a special rate for traders (1%), manufacturers (2%) and restaurants/ dhabas (5%) provided their turnover is less than INR 50 lacs. Now, this composition scheme can be opted for by the taxpayer and the requirement of permission has been dispensed. b. Compensation Cess is proposed to be levied on aerated water (upto 15%), specified passenger cars (upto 15%), pan masala (upto 135%), tobacco (upto INR 4,170/- per thousand sticks and 290%), coal etc. (up to INR 400 per tonne). India plans to introduce an anti-profiteering measure to ensure that the benefits arising out of the GST regime is passed on to consumers. Note: The Model Draft GST Law only empowers the Government to constitute the Authority but does not prescribe any method to determine the benefit which the supplier is liable to be pass on. Some anti-profiteering guidelines could be prescribed in the near future. As per Model Draft GST Law, a registered person engaged in taxable activity is required to issue an invoice. Additionally, returns of outward supplies are required to be filed in GSTR-1 format (upto 10th of subsequent month) and that of inward supplies in GSTR-2 format (upto 15th of subsequent month). Most of the definitions provided under the Model Draft GST Law have been retained except some changes in definition of works contract, business etc. and coverage of 'actionable claims' which were covered under the definition of 'goods' in Model Draft GST Law. The GST Bill provides that the taxpayer shall not be allowed to furnish the details of outward supplies between the 11th and 15th of the month succeeding the tax period. Also, he shall either accept or reject the details communicated under inward supplies, on or before the 17th but not before the 15th of the month succeeding the tax period. The GST bill also provides that an invoice may not be issued as tax invoice if the value of the goods or services or both supplied is less than INR 200 subject to prescribed conditions. a. Works contract definition will be relevant only for immovable property and a works contract, say for movable property, could be governed by definition of composite supply. b. On actionable claims, GST law specifically provides that actionable claims other than lottery, betting, gambling will not attract GST. c. GST law specifically provides that land and completed buildings will not attract GST. 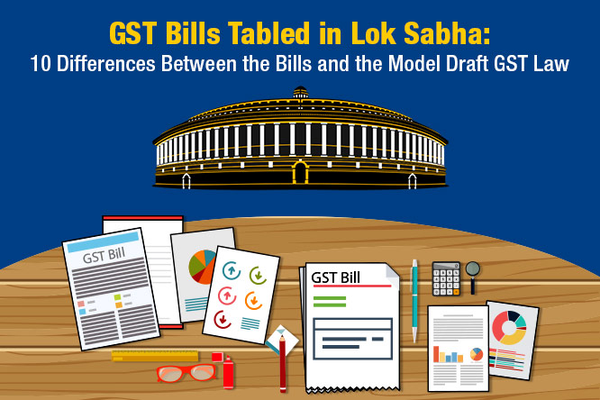 The GST Bill will be discussed in the Lok Sabha on March 29, 2017. In days to come the State legislative assemblies are expected to table SGST Acts in their respective assemblies. We can also expect most of the rules and regulations to be made available. The Government is slowly pushing the GST through in a systematic fashion. It is now the turn of businesses to gear up for GST! You may read our earlier articles on Understanding the GST in 5 Simple Ways and Action Plan to Get GST Ready to help you define your GST strategy. IRIS has been in the compliance space for over 2 decades, having worked with regulators and filing entities alike. On one hand, our solutions power the likes of the Reserve Bank of India and ACRA, Singapore on the regulatory side, and on the other, we support over 700 Indian corporates to meet their MCA filing requirements. As an empanelled GST Suvidha Provider, we are now applying our deep expertise in compliance to offer IRIS GST, a highly reliable and scalable solution to meet your GST compliance requirements. Please contact us here to register for a demo. In the meanwhile, if you have any queries, you can reach out to me at support@irisgst.com. CA Pritam Mahure works in the field of Indirect Taxes (Service Tax, Excise and Goods and Service Tax) for more than a decade. Pritam has also worked with leading multinational consulting organisations and has authored books on “Service Tax” and “GST” for Bharat Publication, CII and New Book Corp. Pritam has addressed more than 100 conferences/ seminars and 12,000 professionals on GST and Service Tax for CII, ASSOCHAM, NASSCOM, MCCIA, ICAI, DGST, NACEN, and Government offices across India.